If it looks and smells and tests like oil -- isn't it oil? Since our flight last Friday August 19 where we documented surface oil and globules near the site of the Deepwater Horizon Macondo well explosion in April 2010, others have taken boats out to the positions we recorded. They saw, smelled, and sampled just what we had seen. Scientists at Louisiana State University analyzed and pronounced it to be Louisiana "sweet crude" -- common jargon that belies its foul intrusion into the habitat of local whales, dolphins, sharks and other marine life. But both BP and the US Coast Guard say they have sent surface vessels, submersibles (ROVs), and aircraft out there continuously since our report last week. They report that they have seen nothing, that "there is no scientific evidence" of any oil in the Macondo Prospect. Are they flying and sailing with eyes and nose closed? We are not trying to dramatize here. Certainly the sheens and globules we've documented are not as expansive as what we documented all last summer. But isn't oil that shows up over large areas on the surface of water that is several thousand feet deep more than a minor seep? Grant us the right to a bit of distrust and caution, for where there is this, could there not soon be a bigger fissure or crack to come? And with hurricane season upon us, are we not prudent to ask for all precautions possible at this time? This is more editorializing than we usually allow ourselves here. On to the facts and photos and videos from two flights made Thursday and Friday, August 25 and 26. Both days had rough seas and below-average sky and water visibilities; Friday August 26 was particularly bad. Stoms since last Friday August 19 had definitely changed things, but as you'll see below, we had little trouble finding surface oil sheen and floating globules again around the Macondo site. 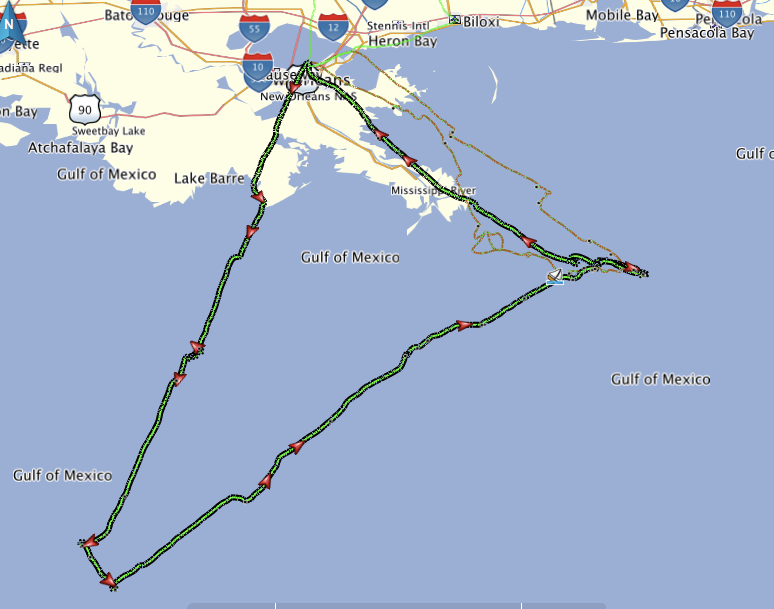 To the Thunderhorse PDQ rig, the Macondo site, and back to New Orleans along the eastern coastline. To the Macondo site to guide a private vessel to obtain oil samples. Thursday's flight was a long one, in order to check out the giant "Thunderhorse PDQ" BP-ExxonMobil platform (Production and Drilling, with crew Quarters) that sits well over 100 miles from nearest land in over 6000' of water. News reports and satellite images had shown large areas of sheen in this area last week. Enroute there we saw many large tankers and oil rigs and large supply vessels. At the Macondo site we again found sheen and globules. And on the way home we were surprised to find a very large area of thick sheen in the wetlands area northeast of Venice! Photos and details below. Friday's flight was made in order to direct a boat with scientists and oil sampling equipment to the oil we've been seeing out at the Macondo well for the past week. Even though Friday's flight had no photographers or spotters on board, we had no problem finding the oil even with the rough seas and very poor flight visibility -- it was harder to see the boat than it was to spot the oil! All we had was an inexpensive point-and-shoot digital camera, but you'll see what we saw well enough. Photos and details below. Remember that you can download all of our aircraft GPS flight tracks with all metadata for waypoints. Just go to the main menu item "Flight Tracks" and download the flight files you want. Read more: If it looks and smells and tests like oil, isn't it oil? Why hasn't all the oil gone? 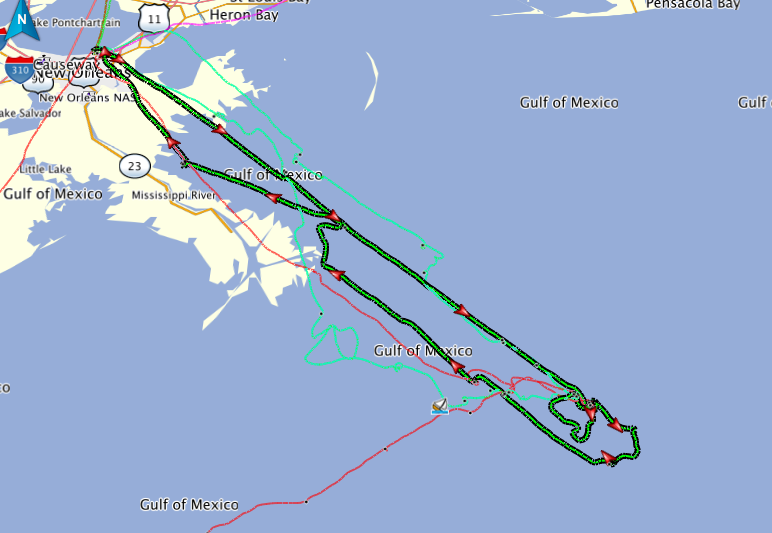 Today we flew about 500 miles over the Gulf to check out yet more reports of oil. We didn't even get to some of the places reported, because in just a few hours we had already found plenty in at least four distinct locations -- all within 75 miles of the shores of Louisiana! 1. Breton Island, where last May we documented many subsurface dark reddish brown plumes surrounding the island rookery and spanning many miles north and south (see stories here). 2 The site of the defunct Ocean Saratoga platform owned by Taylor Energy, whose leak and extensive surface oil slick we documented this past July (see story here). 3. The site of the Deepwater Horizon (DH) explosion in April 2010, where fresh oil has been reported to be present still. Click here to read the article and see photos and video of the day's flight, taken by colleagues Jonathan Henderson and Tarik Zawia from the Gulf Restoration Network! We found significant amounts of oil in globule form still at the Deepwater Horizon (DH) site and at the Taylor Energy site, and we saw miles-long surface rainbow sheens from two different leaking platforms between DH and the Chandeleur Islands. Eight shrimp boats with their nets in the water were within one mile of these two leaking platforms. In the 'blue waters' out toward the DH site we were puzzled by some long, wide, unnatural-looking dark-green colored stripes. Finally, dark brownish-red subsurface plumes like what we had previously documented around Breton Island (Mar 2011) spanned miles in width and length, right up to the coastlines, beginning where the Mississippi River Gulf Outlet ("MR-GO") meets the Gulf south to Breton Sound. With all of that, we were ecstatic also to see three sperm whales, one leatherback turtle, four whale sharks, tuna, redfish, bottlenose dolphin, and cownose rays. Some things puzzle us: We have seen substantial oil almost every time we've flown in the Gulf since March of this year, and yet we hear about very little of it in the media. Is that because no one else has been flying over the Gulf to see what's really going on? Is it just coincidence that all of these other offshore platforms have suddenly been leaking since the Deepwater Horizon (DH) explosion in April 2010? Or has the Gulf been suffering chronically from this kind of leakage? How much of the oil we've been seeing this year has anything to do with the DH explosion? A large fraction of the samples taken from these observed phenomena have contained oil whose 'fingerprint' matches that from the DH site. That doesn't mean that everything we're seeing comes from the DH incident; but it does seem safe to conclude that 1) oil from the DH explosion has made it quite a ways from the original site; and 2) there are many other oil leaks present in the Gulf! Read more: Why hasn't all the oil gone? This time the stranded animal in need of rescue was us! Well, we had our first genuine flight 'failure' on today's flight from Wisconsin down to New Orleans! But our experience and preparation for emergencies served us well -- and, fate was kind. With no hint that there was anything wrong with our engine at all, we departed West Bend, WI just after sunrise Monday morning in order to beat some very bad weather going on around and south of St. Louis, MO. We didn't quite beat it though. And when we tried to climb to 10,000 feet as instructed by Air Traffic Control, Bessie (our faithful plane) didn't climb very well. But we made it through the bad weather and, since she seemed to be running smoothly, we descended to land at a small rural airport in Yazoo City, Mississippi, where we guessed that fuel might be inexpensive and the stop could be brief. We taxied to the self-serve fuel at what from the ground now appeared to be an almost abandoned airport, only to find an "Out Of Order" sign on it! Not wanting to waste a drop of fuel at this point, we didn't even shut off the engine, but just taxied back to the runway for takeoff. The engine was rough when we applied power for takeoff! She climbed well enough for the flat terrain around there, and the engine smoothed out on takeoff, so I opted to continue 20 miles to the very next airport, Williams Airport in rural Raymond, MS. But my brain and senses were on high alert! We refueled there, but Bessie never fired again. Read more: Stranded in Raymond, Mississippi! Ten Lucky Dogs from Death Row to Love in Canada! Click here to see the photos and video and read about this beautiful and exciting rescue flight that took us from southern California across the Sierra Nevada range, then across the northern Rockies up into Alberta, Canada! "A bit too exciting in terms of winds and afternoon thermal turbulence for me to take my hands off the controls to snap any photos of the gorgeous Sierras, Cascades, and northern Rockies -- but trust me, they were sights to behold! Hansen (the poodle) seemed particular entranced with it all, and he was often standing on his hind feet right behind me gazing out at the scenery. But let's start at the beginning before we get to the excitement..."
Read more: Ten lucky dogs from death row to love in Canada! An ambitious new rescue campaign has begun! Click here to read about our ambitious new rescue campaign! We can take no more. If you all could see the outrageously high number of beautiful, healthy, adoptable, outstanding animals that are being killed every single night in high-kill shelters in California alone, you would think this world has gone insane. And you might also feel crushed inside, as we do. We are slowly but surely starting to work behind the scenes to change some of the worst of these high-kill shelters to low-kill and ultimately, we hope, to no-kill shelters. You can read a series of articles and videos we've started posting on our Facebook site here. And as we make progress that we can publicize, we'll also post articles on this website.